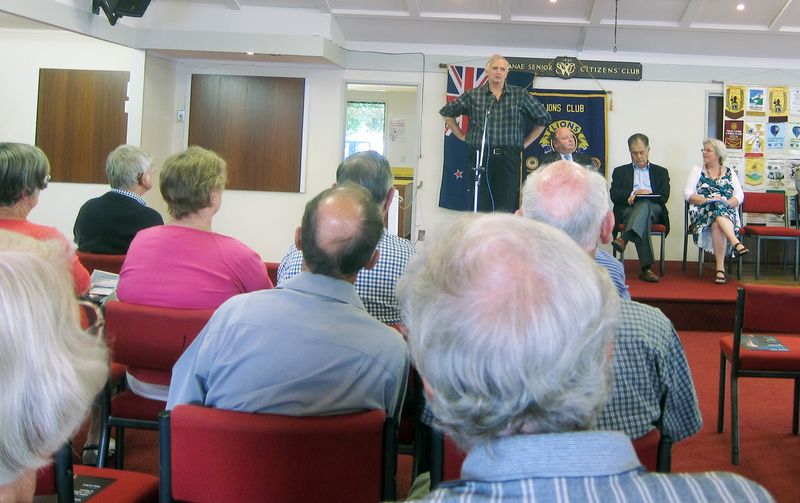 The five candidates for the KCDC Waikanae Ward councilor by-election addressed a candidates meeting organised by Grey Power this morning. While the candidates presented their views on different local issues, it was a good opportunity to hear what issues concern the attendees. It’s fairly clear that the proposal for a super-city, rates for what services are received for them, the future of Mahara Place and water were the main ones. Like Geoffrey, Michael Scott, who is chairman of the Waikanae Community Board doesn’t like the super-city notion; other candidates seem to be straddling the fence. All seemed to agree Mahara Place needs a makeover to make an appealing shopping destination post-Expressway opening and no-one seemed to like water meters. While they are a fait accompli, they are only considered to have a lifespan in the ground of 10 years, so they may not be a permanent feature of the scene.